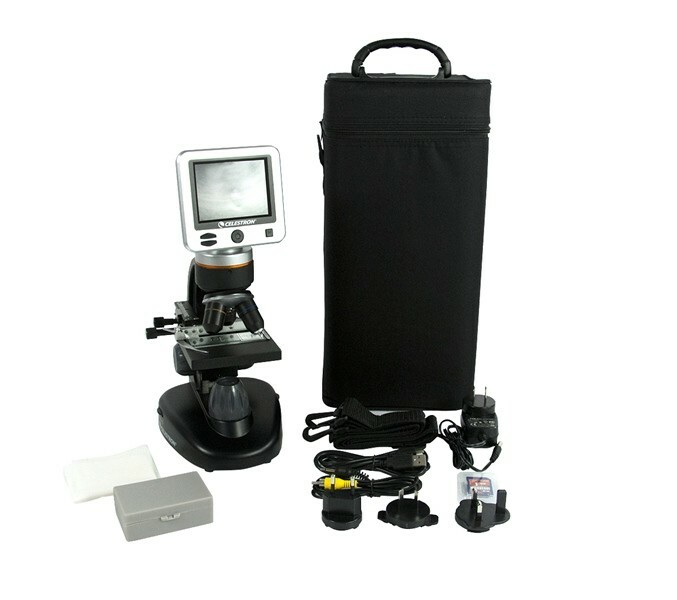 The new Celestron LCD Digital Microscope II is a fun, powerful and easy to use Microscope featuring an innovative LCD screen ease of use. It is ideal for examining visually and/or taking photos of specimen slides such as yeasts, molds, cultures, fibers, bacteria, insects, and blood. The Celestron LCD Digital Microscope II is an innovative and exciting to use microscope which offers a new level of accessibility when it comes to observing biological specimens. 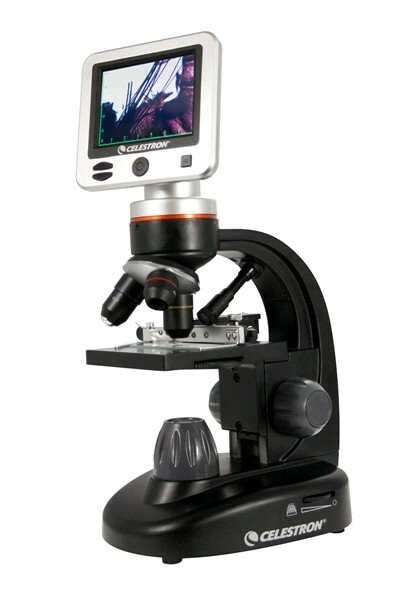 Replacing the traditional eyepiece with a high resolution LCD screen for easy viewing, the Celestron LCD Digital Microscope makes viewing a relaxed and much more natural activity. Boasting a built-in 5 Mega Pixel camera and a 1GB SD Card that will enable quick and easy photo and video capture. Take vibrant, high resolution images which can be easily transferred to a computer using the included USB cable. Alternatively, store images and video on up to 16GB of memory using the SD expansion card slot. The Celestron LCD Digital Microscope II offers excellent flexibility in magnification, with three built-in objective lenses providing optical magnifications of 40x, 100x and 400x. Experience up to 1600 power using 4 x Digital Zoom! Top and bottom LED illumination ensures the specimen is well lit and a Six Position Color Filter Wheel ensures plenty of contrast can be obtained. The Celestron LCD Digital Microscope II is best suited for viewing biological specimens, but can be used to observe thin objects such as stamps and coins on the lowest magnification setting. Additional lighting from a desk lamp etc may be necessary for this usage. 4 x Digital Zoom allows magnification up to 1600x!